We’d love your help. Let us know what’s wrong with this preview of Song of the Oceanides by J.G. Źymbalist. J.G. Zymbalist's debut is a quirky but poignant coming-of-age tale about children, Martians, freaky Martian hummingbird moths, and alluring sea nymphs. The first thread relates the suspenseful tale of a Martian girl, Emmylou, stranded in Maine where she is relentlessly pursued by the Pinkerton Detective Agency's Extraterrestrial-Enigma Service. The second thread conce J.G. Zymbalist's debut is a quirky but poignant coming-of-age tale about children, Martians, freaky Martian hummingbird moths, and alluring sea nymphs. The first thread relates the suspenseful tale of a Martian girl, Emmylou, stranded in Maine where she is relentlessly pursued by the Pinkerton Detective Agency's Extraterrestrial-Enigma Service. The second thread concerns her favorite Earthling comic-book artist, Giacomo Venable, and all his misadventures and failed romances. The final thread deals with a tragic young lad, Rory Slocum, who like Emmylou, loves Giacomo's comic books and sees them as a refuge from the sea nymphs or Oceanides incessantly taunting and tormenting him. To ask other readers questions about Song of the Oceanides, please sign up. For a first published book, this shows a lot of depth, potential and is very gripping. It is one of those books you read to connect with in more ways than one. You don't just feel and see the story unfolding, you become part of it. You connect yourself and your life to the happenings and it really makes you think. I found the characters exceptional. They contained a lot of depth and personality, which I would expect from a book with this level of detail and attention to the little things. Each c For a first published book, this shows a lot of depth, potential and is very gripping. It is one of those books you read to connect with in more ways than one. You don't just feel and see the story unfolding, you become part of it. You connect yourself and your life to the happenings and it really makes you think. I found the characters exceptional. They contained a lot of depth and personality, which I would expect from a book with this level of detail and attention to the little things. Each character develops over time, rather than developing and just stagnating, which keeps the book very interesting. I like the depth of the book. It is layers upon layers of story, and you can choose just how far you want to Goliath thinking about what the author is saying, or you can just sit back and enjoy this lengthy and exciting read. I really liked the book and am looking forward to seeing more from this author. It was different and really stand out to me. I had no expectations coming in and reading Song of the Oceanides – the combination of Martians, Martian hummingbird moths, sea nymphs, and artists, seemed like it could either go extremely wrong or extremely right. It certainly didn’t sound like any books I had ever read before. Turns out, it all worked out rather well, and even if the combination of all those different characters sounds implausible, it’s actually a very intriguing story that interconnects these different characters. What connects the characters primarily is the Song of the Oceanides. Completely explaining what it is would spoil some elements from the book, but it connects two stranded girls, one of them a Martian named Emmylou, with a comic book artist named Giacomo Venable, and with Rory Slocum, a young man relentlessly tormented by sea nymphs. 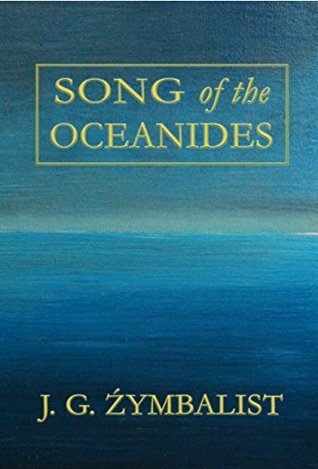 Song of the Oceanides by J.G. Źymbalist is a powerful fictional read. Instantly readers are hooked by the emotional attachment that J.G. Źymbalist creates throughout his writing. From the beginning, readers will feel sympathy, loss, and fear. We can easily put ourselves into the first character' shoes. It's never easy to lose someone, especially one's parent. The character's agony from hearing the Song of the Oceanides...feels so real that it becomes the reader's own fear. Then as the story unfo Song of the Oceanides by J.G. Źymbalist is a powerful fictional read. Instantly readers are hooked by the emotional attachment that J.G. Źymbalist creates throughout his writing. From the beginning, readers will feel sympathy, loss, and fear. We can easily put ourselves into the first character' shoes. It's never easy to lose someone, especially one's parent. The character's agony from hearing the Song of the Oceanides...feels so real that it becomes the reader's own fear. Then as the story unfolds...another set of fear and panic comes tumbling in like waves hitting the shoreline harshly...wave after wave. I didn’t care for this book, at all --- mostly I was frustrated because the author put a poem in the beginning in German, I think. I spent four days looking for a translation and there wasn’t one in the book and I couldn’t find on the internet --- so why put it in? I really truly tried to enjoy the book but at over 763 pages there was no place you could read it and be comfortable and way too heavy to lug around any place ---- so sorry but, it just was NOT my type of reading --- and at the end I I didn’t care for this book, at all --- mostly I was frustrated because the author put a poem in the beginning in German, I think. I spent four days looking for a translation and there wasn’t one in the book and I couldn’t find on the internet --- so why put it in? I really truly tried to enjoy the book but at over 763 pages there was no place you could read it and be comfortable and way too heavy to lug around any place ---- so sorry but, it just was NOT my type of reading --- and at the end I really didn’t see where anything had happened! I adore science fiction, history, fantasy, space, Greek myth but thrown all together in one book --- was just a mess to read! I was given this book by author Buzz for a review. This book starts on page 135, which confused me, because I thought some pages were missing. Another person that reviewed this book said that there was a poem at the beginning of the book in German. I did not see that poem in my book. This book had several characters that were not completely described and the book was difficult to follow. He wrote the original draft of his other experimental work,Hymn to the Ni J.G. Źymbalist began writing Song of the Oceanides as a child when his family summered in Castine, Maine where they rented out Robert Lowell’s house. He wrote the original draft of his other experimental work,Hymn to the Night, while night clerking at a series of Palestinian youth hostels in the Old City of Jerusalem, 1996-1999.